Catholic Charities has a new website! 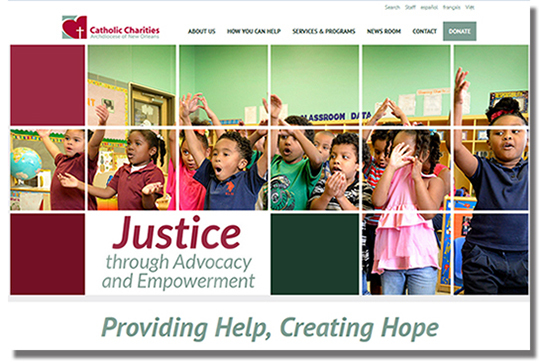 Catholic Charities Archdiocese of New Orleans is pleased to announce our new and improved website at www.ccano.org. Please visit our site and check out what's new! We have worked hard to evolve our online presence to meet the needs of our programs, clients, donors and friends. We hope you like what you see! Health Guardians has been recognized for their quality of care and leadership by the Louisiana Performance Excellence Awards (LPEA) Program which recognizes performance excellence and leadership in both profit and non-profit Louisiana organizations in the areas of manufacturing, service, health care, education, and the public sectors. This year, our Head Start program has been blessed by the support of Raising Canes. Recently, team members from Raising Canes stopped by to catch the Head Start fun in action at our annual Head Start Mardi Gras parade. Known throughout Louisiana for their delicious chicken strips, Raising Cane’s makes community involvement a priority and an important part of their culture. Education is a foundation for communities and we are thankful for their commitment to early childhood education and support for parents through our Head Start program! Thank you for your support in our 2015 Parish Appeal Second Collection! The second collection at all Masses in the Archdiocese of New Orleans the weekend of February 28 and March 1 benefitted Catholic Charities. Thank you for remembering us in your prayers and for your support this weekend. Don't forget, you can make a donation to support those in need online 24/7 at our website. What You Give Up for Lent Changes Lives! In its 40th year, CRS Rice Bowl is your way to help our brothers and sisters in need each Lent. CRS Rice Bowl is Catholic Relief Services' Lenten faith-in-action program for families and faith communities. Many parishes in the Archdiocese of New Orleans will be participating this year. We hope you will join them in this life-changing campaign in the next 40 days of Lent. Learn more at CRS Rice Bowl.